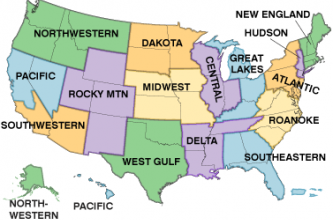 ARRL's governance structure divides the United States into 15 ARRL Divisions. Every three years, ARRL members in each of these Divisions elect both a Director and a Vice Director to represent them on the ARRL's Board of Directors. The ARRL Board determines the ARRL policies that are implemented by the HQ staff. Each Division's Director and Vice Director represent their Division on ARRL policy matters. If you have a question or comment about League policies, contact your Director or Vice Director at the address below. 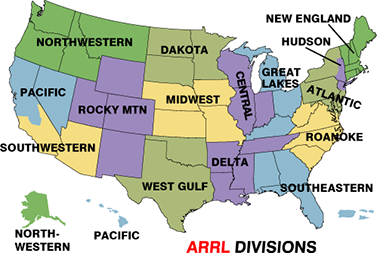 The 15 Divisions of the ARRL are arranged into 71 administrative Sections. Each Section is headed by an elected Section Manager (SM). Most sections consist of entire states, however, some states have more than one section. For your convenience, we have included direct links to the individual Division Web sites. Where individual Division Web sites are not available, a link to the ARRL -sponsored Division page has been provided.